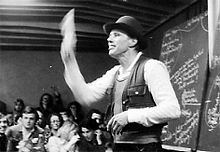 2.7 The concept of "Social Sculpture"
In 1961, Beuys was appointed professor of 'monumental sculpture' at the Kunstakademie Düsseldorf. His students were artists like Anatol Herzfeld, Katharina Sieverding, Jörg Immendorff, Blinky Palermo, Peter Angermann, Elias Maria Reti, Walter Dahn [de], Johannes Stüttgen [de] Sigmar Polke and Friederike Weske. His youngest student was Elias Maria Reti who began to study art in his class at age fifteen years. ^ "Elias Maria Reti - Künstler - Biografie". www.eliasmariareti.de (in German). Retrieved 18 December 2018. ^ Halpern, John (Director) (15 April 1988). [Joseph Beuys / TRANSFORMER] (Television sculpture). New York City: I.T.A.P. Pictures. ^ Robert Ayers (9 November 2005). "Marina Abramovic". ARTINFO. Retrieved 22 April 2008. ^ Art Sales. "Art market news: Joseph Beuys suit sells for $96,000". Telegraph. Retrieved 12 March 2013. 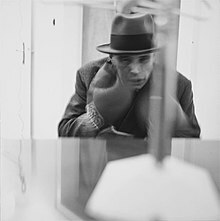 ^ Joseph Beuys (19 September 2012). "P H I L L I P S : Evening Editions, JOSEPH BEUYS, Sled". Phillipsdepury.com. Retrieved 12 March 2013. ^ "» LACMA: Broad, Beuys, & BP". Art-for-a-change.com. 28 March 2007. Retrieved 12 March 2013. This page was last edited on 24 April 2019, at 01:59 (UTC).